Is my EZ Oil Drain Valve going to leak? A. No. 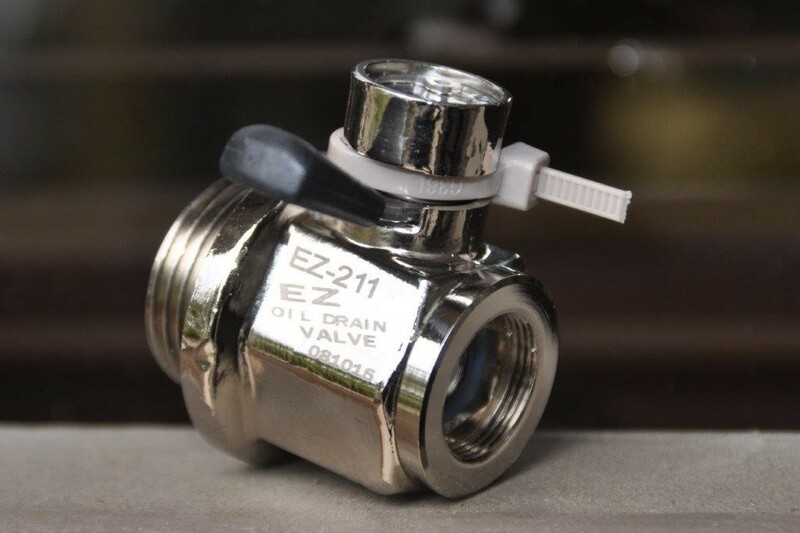 The EZ Oil Drain Valve incorporates the “ball valve” design of valves used in pressurized gas applications and will not leak. Every single valve is constructed under precise specifications and pressure tested, ensuring a perfect seal upon factory approval. The EZ Oil Drain Valve is produced from an ISO-9001 certified factory. Will my EZ Oil Drain Valve open up while I am on the Road? No. When installed, the EZ Oil Drain Valve only extends about 1/2 inch from the oil pan more than a stock oil drain plug in its closed position. The valve's effective locking system requires a double-action mechanism to open it, preventing any accidental openings. Unlike spring-loaded gate valves, the heavy-duty ball valve construction will withstand any engine vibration. Using the EZ Oil Drain Valve under extreme circumstances such as, off-road vehicles, agricultural tractors, and logging equipment (i.e. corn fields, brush areas), it is advised that a hose clip as shown below be applied for additional safety and security. Hose clips can be purchased at any hardware stores and will securely keep the lever closed in the locked position at all times. * A zip tie as shown below can be applied for additional safety and security. Zip ties can be purchased at any hardware store and will securely keep the lever closed in the locked position at all times. The zip tie can be easily cut and removed when you need to change oil. Does my EZ Oil Drain Valve protrude into the interior of the oil pan and prevent full drainage of my engine oil? A. No.The threaded oil drain plug hole is always reinforced to accept the threaded bolt of the drain plug. Your EZ Oil Drain Valve will not extend past this threaded portion of the drain hole and will allow the oil to be properly drained. Your EZ Oil Drain Valve will let you drain your engine oil while it is hot without burning your hands and it is much more effective than trying to pump the oil out from above. How long will my EZ Oil Drain Valve last? A. Your EZ Oil Drain Valve is constructed out of corrosion-resistant forged brass, stainless steel, and nickel-plated for added protection from the elements. Brass is the ideal material as it can withstand temperature extremes as well as harsh environmental factors. (I.e. salt, water, oil, chemicals, etc.) Your EZ Oil Drain Valve will outlast your engine. How much does the EZ Oil Drain Valve extend out from the oil pan? A. 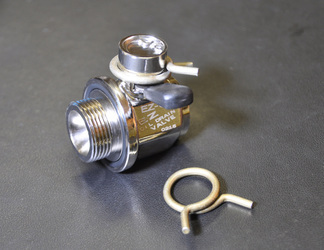 The EZ Oil Drain Valve for passenger cars and light trucks is approximately 7/8" long. This means that the valve only extends out 1/2" more than the standard plug head outside from the oil pan. How do I install and use my EZ Oil Drain Valve? Installation is easy. Simply follow the instructions below. Hand install the valve until tight, and give 1/8 turn with a small crescent wrench on the body. When it’s time for an oil change, using your EZ Oil Drain Valve is simple. Lift up the lever and turn counter-clockwise. Turn back the lever to close. Make sure the lever is secured in the locked position. How do I know which EZ Oil Drain Valve to use? My oil pan has a recess around the drain plug. Can I still install my EZ Oil Drain Valve? A. Yes. Engines with a recessed oil pan may require an adapter (A-106, A-107, etc.) to prevent the valve from hitting against the oil pan wall during installation. Although our application chart indicates engines requiring an adapter, it is always recommended to determine the shape of the drain port. (In some cases longer adapters are necessary, i.e. part number AL-106). See Sizes & Applications for more details. What is recommended torque for installing the Engine Oil Drain Valves? A. We recommend to install the valve by hand and give it last 1/8 turn with small crescent wrench. Here is the list of reccomended torque for your information. How do I know which Hose End to use/buy? Can I use the EZ Oil Drain Valve for other applications? A. Yes, the EZ Oil Drain Valve can be used for many applications, including transmission oil, radiator coolant, water drain, and synthetic motor oil. Re-tap your current stripped oil pan threads to the next largest thread size and install the corresponding EZ Oil Drain Valve. For example, if your original thread size is 12mm-1.5, re-tap it to the size 14mm-1.5 and use the EZ Oil Drain Valve Model No. EZ-106. You can hire a mechanic do this for you, or you can do it yourself if you have the right tools and skills. Once the EZ Oil Drain Valve is installed, while you are enjoying quick and mess-free oil changes, you will never have the problem of stripping the oil pan threads again! What is an NPT plug? National Pipe Thread (NPT) plugs are tapered and they are self-tightening plugs. As you turn and tighten the plug (or the valve), it gets tighter and it will eventually stop with a few threads still exposed. 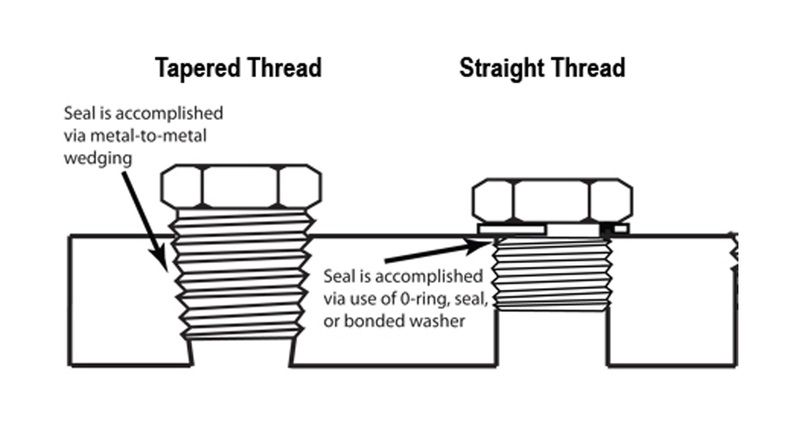 Since these types of plugs use the compression between the male/female threads to seal, they do not require gaskets or washers to seal between the flange and the oil pan. How do I know if I have an NPT plug? A. If your oil drain plug does not have an O-ring or washer/gasket, then it is most likely tapered and therefore an NPT plug. How do I measure an NPT plug? Here’s the tricky part. NPT plugs always have an actual outside diameter (OD) that is approximately 1/4” greater than the Trade Size. Measuring the actual plug will oftentimes mislead you into choosing the wrong valve, so please follow the chart below. If you've worked with pipe threads much at all, you've probably noticed that the size of the pipe isn't really what size the pipe is. Unlike tubing, which is generally specified by its OD, or hose, which is generally specified by its ID, pipe is specified by something else... its Trade Size. So when you say "NPT 3/4 plug," you're actually saying "NPT plug whose OD is a little more than an inch.